pdf download is now available. Thyron Shedrak, supreme commander of the Imperial Army, watched the battle. Seemingly endless rows of green-skinned creatures surged towards the Imperial positions. Huge abominable monstrosities towered above the mass of armour, shields, and spears, wielding gigantic weapons. The advancing ogres hit the thin line of the Imperial footsoldiers; mighty axes and big, double-handed swords struck at shields and armour. The Imperials had to withdraw before the onslaught of the ten foot-tall monsters, but Khaibar Thyron Shedrak hadn’t expected otherwise. When the first ogres broke through the Imperial line, he raised his hand and ordered the Knights of the Order to attack. While the ogres were still rallying, the heavily-armoured riders began their charge with couched lances. The trot of the heavy battle-steeds accelerated to a thundering gallop, and moments later the spearhead of the formation clashed into the ogres’ flank. The age of darkness has begun. The dreadful demon hordes of the Icelords of Isthak, Clanngett’s Orcs, and the barbarian war clans of Thain are assaulting the Empire. Will heroic Knights of the Order and Noble Imperial troops emerge victorious, or will the creatures of the Dark Forces triumph? DEMONWORLD is a game of fantasy battles with miniatures played on hex maps. The easy-to-learn rules provide three levels of difficulty and encompass commanders, formations, terrain, morale, chariots, artillery pieces, Dragons, Giants, flying creatures, magic, fire, artefacts, buildings, and scenarios. The core rulebook includes sample forces for Empire and Orcs. There are currently forcebooks available for Orcs, Empire, The Icelords of Isthak, Elves and Dwarves. 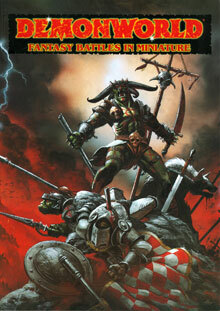 Forcebooks for The Warlords of Thain, Goblins and Dark Elves will be coming soon.